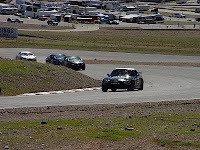 Sage Marie claimed the T3 class checkered flag in each of the two races in his Honda Racing/HPD BFGoodrich Honda S2000, earning qualifying and race track records in the process. 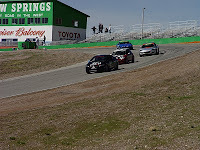 Lee Niffenegger finished the weekend with two SSB class wins in his Honda Racing/HPD BFGoodrich Honda Civic Si and also set a new qualifying lap record. 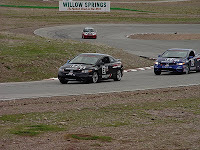 Matthew Staal piloted his SSB class Honda Racing/HPD BFGoodrich Honda Civic Si to a third place finish on the Saturday race and a second place finish on Sunday in heated battles with Oregon-based Civic Si driver, Eddie Nakato. Nakato finished second and then third in each of the races, respectively, and posted SSB track record on Sunday. Although fast all weekend, an exhaust sound issue threatened to disqualify Marie every session. With a great deal of help from Civic Si driver Eddie Nakato, he was able to fashion a make-shift exhaust silencer from scrap sheet metal. 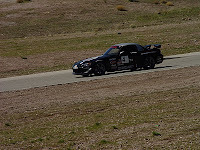 Although it had to be rebuilt for each time on track, it was enough to reduce the S2000’s sound output below the 103db sound limit, allowing Marie to qualify and pole and take victory both days. The RealTime Racing Acura TSXs claimed the top three spots in their GTS category debut in the SCCA World Challenge season opener at the Acura Sports Car Challenge of St. Petersburg on Saturday afternoon. On Sunday morning, they delivered the exact same result in Round 2 of the 12-event 2010 season. Coming into the weekend, each of the World Challenge teams faced a difficult mission: Two practice sessions and qualifying on Friday, preceding races on each of the next two days—all within the confines of the concrete-lined streets, with two other classes of production-based sports cars competing at the same time! With few exceptions, everyone made it through in one piece. Qualifying couldn’t have gone any better for the two-car Acura Motorsports team. Peter Cunningham, in the No. 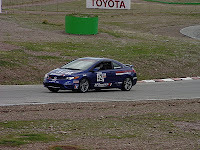 43 TSX, scored his 33rd World Challenge career pole position, with Nick Esayian, in the matching No. 34, close behind in second. The next thing you know, the expert RealTime crew was commissioned to prep the third TSX for competition. Following tech inspection and the addition of a few new decals, the team added the No. 1-plated (as defending World Challenge GT champion, Brandon earned that honor) Acura to the tail end of the 31-car field. The band was getting back together. 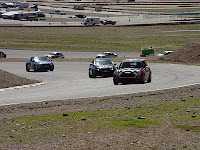 As the start lights were extinguished to begin Round 1, three classes of cars drag-raced down the temporarily inactive airport runway and into the tight Turn 1. Miraculously, only two (GT) cars were eliminated in the melee that followed, and the race unfolded almost without further incident. Cunningham led from the start and took the win without drama, but in his rearview mirror, a battle for second was unfolding. Esayian fell to third during the race to the first turn, but pushed the third-quickest qualifying Honda lap after lap before sneaking by on Lap 6. Meanwhile, Davis was re-learning the tricky 14-turn, 1.8-mile labyrinth, cleanly picking his way through the field. As the checkers flew, the GTS running order was Cunningham, Davis and Esayian; RealTime Acura’s sixth-ever podium sweep! The RTR boys were feeling pretty good about the first race’s results, but they knew they had only a precious 16 hours before it would be time to do it all over again. And the threat of thunderstorms was ramping up, which wasn’t the kind of thing anyone would look forward to in the confines of a street circuit. If Saturday’s victory was never in doubt for Cunningham, Davis was certainly determined to make a point on Sunday. From the same dead-last starting spot, the former Rookie of the Year for RTR came rocketing through the field, setting the race’s fastest lap in the process. After getting by then-second place Esayian on a Lap 11 restart, he set his sights on his former boss. As the laps wound toward the finish of what turned out to be a timed 50-minute race, Davis had the heat set on ‘high.’ Fortunately for Cunningham, the fast GT traffic continually muted the attack. Which is not to say that Cunningham got all the breaks, but the ebb and flow of traffic allowed Cunningham to secure his 34th World Challenge race win. Once Esayian was bumped to third, he wisely bided his time in case of an additional full-course caution and crossed the stripe in third for the second consecutive day. So for Day Two, different race—same result, and RealTime’s record-seventh sweep of a World Challenge rostrum! On the strength of their duplicate finishes, Cunningham and Esayian sit first and second in the GTS drivers’ points. It’s still early days in the battle for the 2010 title, but the two Acura drivers have to be pleased with their strong start to the year. And nary a scratch on either car! With this tough weekend in the books, the World Challenge circus will reconvene in SoCal’s Long Beach, North America’s oldest and most renowned street circuit, on April 17-18. With a new Corvette and three supercharged Lotus Exiges added to the GTS-class entry list, the Acuras will surely be put to the test. This weekend’s Acura Sports Car Challenge of St. Petersburg World Challenge doubleheader will air on Versus HD on Sunday, April 18 at 2 p.m. EDT. RealTime Racing is sponsored by Acura Motorsports, Acura Certified Pre-Owned Vehicles, Red Line Oil, Eibach Springs, Sparco, Hawk Performance, Brembo, A-SPEC, BOSCH, Total Auto Body, and PACT. For the complete gallery of photos from the race weekend, please visit here.